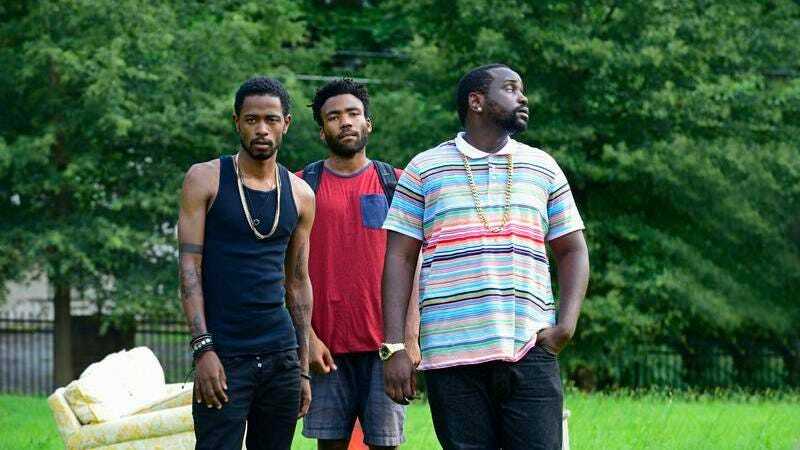 In its first season, the finale of which aired on Tuesday, Atlanta effectively solidified itself as an offbeat show about black people that dares to experiment in surreality. That subtle tone begins with its all-black writing staff, and their ability to essentially write about us by first writing about themselves. It’s a strange and, ultimately, funny show where the writers get to ask questions like, “What if Justin Bieber were black?” and make an entire episode out of it. Along with creator/writer Donald Glover, who plays the show’s broke rapper-adjacent lead Earnest Marks, the writing staff also consists of Donald’s brother Stephen Glover, Jamal Olori, Fam Udeorji and Stefani Robinson. I spoke to Robinson, who’s credited as a writer on six of the 10 episodes, over the phone (she’s based in Los Angeles) about the dynamic of the writing room, themes they explore and how the show tries to visualize various forms of black identity. Here’s our lightly edited interview. JEZEBEL: There are a lot of reasons why Atlanta is one of the best new shows on TV, but a lot of it has to do with the writing. And I think more specifically, the subtlety of the writing and tone. I know that was a conscious decision from Donald Glover. How did you get on board? STEFANI ROBINSON: I was sort of, I think, one of the last pieces of the puzzle. I was actually working as an assistant at a talent agency at the time I got asked to join the show. The rest of the writers are either friends with Donald—one of them is Donald’s brother—and they’ve known each other for a long time. They were looking for one more writer. I think they were consciously looking for a black female writer who had spent time in Atlanta. And it just happened that my managers had sent over an original pilot that I wrote to FX at the same time that they were looking to staff on Atlanta. So it was just this really kinda lucky, serendipitous moment where I was trying to break in and it just happened that Donald was looking for someone like me. What was he looking for and how did you feel you could contribute? I also want to point to an interview he did [with Vulture] where he said, “I wanted to show white people you don’t know everything about Black culture.” It’s gotten some criticism because of the “showing white people” part, which I want to know if you think was misunderstood. I think he was looking for just honesty and he wanted to be around real people who had spent time in Atlanta. Or even, not specifically Atlanta. He just wanted to surround himself with black people who are authentic in terms of their stories and their experiences. I think when I first met Donald, we obviously connected over the fact that we lived in Atlanta. We shared some similar experiences and stories, but we also come from two different places in Atlanta, too. I come from a suburb of Atlanta where it’s mostly white people. It feels more Southern, more country. And I think he was excited that I was able to offer that side of it and that sort of insight. He wasn’t looking for people who are the same as him. He was looking, again, for people who are similar but can take stories in a totally different direction or shine a different light on the experiences of a black person living in Atlanta, or just a black person in general. Which is why I think the fact that he went out of his way to find a female writer is super important. And I’m glad that he did that. In terms of him [laughs] showing white people they don’t know everything about black people, I don’t think it was a misinterpreted quote. I think we all find that we’re very frustrated that we don’t have control of our culture in terms of television and film a lot of the times. So it’s just one of those things where it’s really exciting to be part of a project where we have our hands on the steering wheel in terms of what we’re putting out there about black people. And we are the black people creating it. So to that end, we are the ones showing the world, like, look, there’s an entire experience associated with being black but white people just don’t understand and I don’t think can ever really articulate. You guys basically wrote the show in a house. Can you describe the writing process for a show that tries to defy the format of a conventional sitcom? We wrote in a house, which is pretty unconventional, and our writing process was different than other shows that I’ve been on. Usually, you try to meet in an office, so already it’s sort of loosey-goosey. But in terms of writing, for the first season at least, Donald had a lot of ideas coming in. A lot of the other writers did, too, since they had known Donald for a while. So they already had a solid grasp on some of the episodes, ’cause they’d just been ideas that they’d been talking about for a couple of years. Other than that, we spent a lot of the time on the internet. We were encouraged to use our cell phones and our computers and a lot of the time, we had very deep discussions based on what we were reading on the internet, Vine, Twitter. Lik, some characters are inspired by what we find on the internet. Can you give me an example? Obviously the blog guy. Exactly, someone like the blogger was directly inspired by the internet. Even his little child companion being Bankroll PJ, who plays the little kid, he’s a Vine star. So it’s little things like that where we’re tapped into that internet culture. We discussed a lot of personal experiences and anecdotes. And Donald really likes to shine a spotlight on weird things that’ve happened to us in our lives. We talked a lot about instances where we felt super strange or things in our life that have felt surreal. We spent a lot of time on that or even just questions we have about the world. I mean, we hit pretty deep sometimes. But there’s really no filter on anything we have to say. What was one surreal moment you brought up that either did or didn’t get incorporated into an episode? A lot of it for me was dealt with in the “Juneteeth” episode. I feel like I spent a lot of time not really with black people who were that affluent, and just sort of on the periphery of that. I just remember going to functions like that or being somewhat close to someone I knew who was in that world. I just remember the feeling of being out of place and confused, but also intrigued. It’s a hard thing to articulate, but I think that nightmarish feel of it was something that was used for the “Juneteenth” episode. Were there any—I mean, I’m sure there were arguments or constructive arguments, but did any of them lead to a change in direction in a particular episode, where maybe you were thinking one thing and then it ended up being? Everything seemed to go as planned. Obviously, in terms of the final product, I think we were all excited with how things turned out. We didn’t necessarily imagine something in our heads when we were talking about the scripts. Personally, I think that Donald and Janicza Bravo, who directed two of the episodes that I wrote, I was more pleasantly surprised with the choices that were made on productions than I was annoyed or upset or anything like that. I think we’re all really great about communicating with each other in terms of what we don’t want and what we do want, so if there is any disagreement, we’re very constructive and very open to any changes. You’re dealing with heavy race themes and heavy themes in general, but there’s a light and subtle touch to it. As a writer, what kind of challenge is that trying not to go for the easy laugh or trying to let those pregnant pauses speak for themselves. How is it to write within that framework? It’s something I’m definitely aware of. I don’t know if it’s difficult, but it’s sort of like you’re conditioned, even just as a consumer of television, to go the sitcom route. So a lot of times in my head I know, and maybe some of the other writers, it’s easy for us to be like, oh what if this happened? And we realized, okay well does that feel real? Like, is that a real situation that would happen? Is this a real conversation that would happen? Sometimes it’s not. Sometimes we realized, well oh that’s kind of sitcom-y and we should step away from that. At the end of the day, we want the real thing. We try to get the real thing first. We tried to come up with the real situation or conversation first, a real dialogue or scenario first, and then build up from there. I think that’s where the subtlety comes in. ’Cause we’re not trying to be over the top or cartoonish, even though some of the show is cartoonish because it is a comedy. At the end of the day, as real as we do want to be, we also have to remember that this is a comedy and there is room for jokes and for something ridiculous to happen. That’s why we wanted to write the show in the first place because we are all comedy writers. And I am very glad that the show is very subtle and that we’re making really subtle points, but I do enjoy just the pure dumb comedy [laughs] of the show, too. Was there any episode you felt the closest to as far as writing, either how much you contributed or topically? I really liked the “Value” episode. I wrote that with Donald. It really resonated with me because I feel like I understand where Van was coming from, in terms of her relationship with her friend. I feel like in my life, just as a black woman, I’ve felt inadequate or lesser than many times. And that want or that urge to be able to cut loose and have fun is something that I feel like black women aren’t always able to do. And it’s something that Van, I think, aside from getting into it with her friend, at the end of the day, really just wanted to hang out and smoke weed and go hang out with these guys. But she has other responsibilities. She has another life, and she really isn’t able to do that. And she’s punished for it at the end, which is an interesting metaphor for being a black woman in this country. I felt closest to that one. Black Justin Bieber, I also loved because of just the ridiculousness [Laughs]. I love that one, yeah. I think it’s so great and so crazy that we were able to pull that off. [Laughs]. Really, just in terms of the commentary, making you think, like, wow, if Justin Bieber were black in real life, would he be able to get away with the kinds of things he gets away with? How would that change the dynamic? Would he be forgiven as often or would he be kind of, Chris Brown? I really like that episode, just again for the goofiness of it. And then, obviously “Juneteenth,” which I did write, I love that one and I love Craig, the white host. Exactly. I think he was so good and so funny, and I think he was the most “genuine” person at that Juneteenth, surprisingly, yet he’s sort of painted as this villain, which is just so funny. You mentioned the Van-centric episode. I think part of what the show is good at is showing working-class black people and all those moments where it cuts to, like, the person who says the one-liner, whether it’s the worker in the—I think it was McDonald’s—or the woman in the prison. How important was that in the writing, just showing that part of Atlanta? Yeah, it was super important because Atlanta is such an interesting place where that is the working class. I don’t know how to describe it, but I think it was important to us to only feature black people in any capacity that we could because that is the reality of Atlanta and, specifically the female black working class. That’s what felt real to us. And I think it was important just in terms of on a race level to really just color the world with ourselves. I don’t know if it was intentional that they used mostly women, but yeah. People have compared the show to Louie and in my write-up, I called it “the best new show about nothing,” which is obviously a Seinfeld reference. Do you generally agree with the way the show has been depicted or have there been any instances you’ve been like, this doesn’t make sense. Feel free to disagree with me. I meant “nothing” as in showing those in-between moments. Exactly, and I think that’s just what it is. Is it Seinfeld? No, the show is completely different from Seinfeld. Seinfeld is a multi-cam starring four white people and it is a show about nothing. But there are lots of shows about nothing that are not Seinfeld. And I think that just comes from people needing to categorize the show. I think people are having a hard time categorizing Atlanta and they want to point to something. They want to point to Louie, and they want to point to Master of None, and they want to point to Seinfeld. There are definitely some overlaps, but Seinfeld, I don’t see the connection. Master of None, I kind of see the connection. But yeah, I think the show is honestly so different than anything that’s really on TV right now, so I get people’s need to draw a connections. What are the biggest themes that the show addresses? Because when it first came out, it was like okay, this is a show about a rapper trying to make it, but it’s not just that. I think we just strive to talk about really just black identity. Identity is a big theme. I think there are a lot of people in our series that wear masks, whether that’s literal or in metaphor. But there’s a lot of hiding, especially with Van’s character, especially the “Juneteeth” episode with Van and Earn. They are sort of hiding who they are, and even Monique is sort of hiding who she is and re-appropriating who she is to climb the social ladder. Paper Boi, he was a drug dealer but a rapper and is looking to pursue rap but also hates rap so this sort of self-loathing in a way. We deal a lot with identity and what it means to be a black person in the world today. And I think it’s something that’s conscious in the back of our head and that goes back to us striving for things to be real in some way. I don’t think we actively talk about what themes we want illuminated or anything like that. We just like telling stories that make us laugh and telling stories that are resonant to us. Like, how can I as a black person survive within this machine as myself. Which episode or even just an idea was the toughest to nail for you or try to visualize in the writing? The jail episode was tough for me. Stephen, who wrote it, did an amazing job. Just for me personally I... Not had the concern, it was just, okay most of this episode is going to be placed in a setting that feels like the DMV. So how are we going to make sure that it’s still engaging and isn’t as boring as jail actually is? I think that Stephen wrote it in such a way that was really, really captivating, I thought. He really made such a boring space really entertaining. In my head that was one of the episodes where I was like, how can we pull this off and what is this going to look like? Are people going to get bored of people just sitting in jail? And talking about that. For me at least, it was difficult to really visualize. On that note I guess, maybe the biggest criticism has been about how it is a show where nothing happens in the plot. As far as Paper Boi’s ambitions, he’s still where he was in the beginning. Yeah, I don’t really mind that people feel like nothing happens ’cause I get it. It moves in real time, the show, which you’re either on board with that or not. I totally get that and it’s just a matter of personal preference. And I think, two, it might depend on the viewer. I think there’s a lot happening a lot of the episodes if you’re black, to be quite frank. There are some things that just really go over people’s heads or some emotions that other people who aren’t black really can’t tap into. But I’m sure there are also black people who say nothing happens. Again, we made the conscious choice to have the show move in real time. To that end, nothing’s really happening with Paper Boi, or it feels like nothing’s happening, because we’re trying to portray this in real life. In real life, a rapper with a mixtape who also sells drugs who has one pretty decent song doesn’t shoot to stardom overnight. That’s just not how it happens, so we’re trying to capture I guess the realness of that and I think we’re not trying to be Empire in that way. Empire’s a great show. Exactly, everything happens overnight and there’s nothing wrong with that. It’s great television. The glitz and glamour of the music industry. We just didn’t want to present it that way. We wanted to present it the real way: a dope boy rapper comes up in Atlanta and suddenly he’s not in a really glitzy recording studio with a ton of money going on tour on a private jet. That’s just not the real struggle. For Season 2, maybe there’s more pressure because people are expecting it to be great. How do you go into it and still keep the DNA of the show? What it’s really gonna come down to is us writing for ourselves, which is what we did the first season. We didn’t have an audience when we were writing Season 1 and we wrote scripts that we liked. We wrote scripts that made us laugh and we just need to keep doing that. Now there is an audience and I think it’s very important to listen to what people are connecting with, what people aren’t connecting with. But at the end of the day, we’re writing the show because we’re writing it. And I think we just need to be true to ourselves and true to our gut in terms of, does this make us as a group laugh? Is this story important to us? Have we felt this way before? Just keeping it authentic is the most important thing. Are there things right now that you see and want to explore? Do you have ideas roaming around already? Yeah, we’re writing Season 2 now, so we’re on the internet. We’re at that point in the process where we have some ideas but we also have no ideas. [Laughs] We take it day by day in terms of what sort of things we want to see. It could just be environments. For instance, I want to see more of, like, being in the woods. Atlanta and Georgia has a lot of woods and I just remember growing up and spending a lot of time hanging out in the woods, or hanging out on nature trails. We don’t really showcase that on the show, we do very minimally. It’s such a weird creepy environment in Atlanta, this big city with all this sort of lush vegetation around it. I think environments like that would be cool to take characters and tell stories. I’ve wanted to be a TV writer for a long time and always thought it would be for a very specific audience but I’m glad there’s probably like a 16-year-old black person who’s inspired to, you know, contribute artistically to culture, which is awesome.